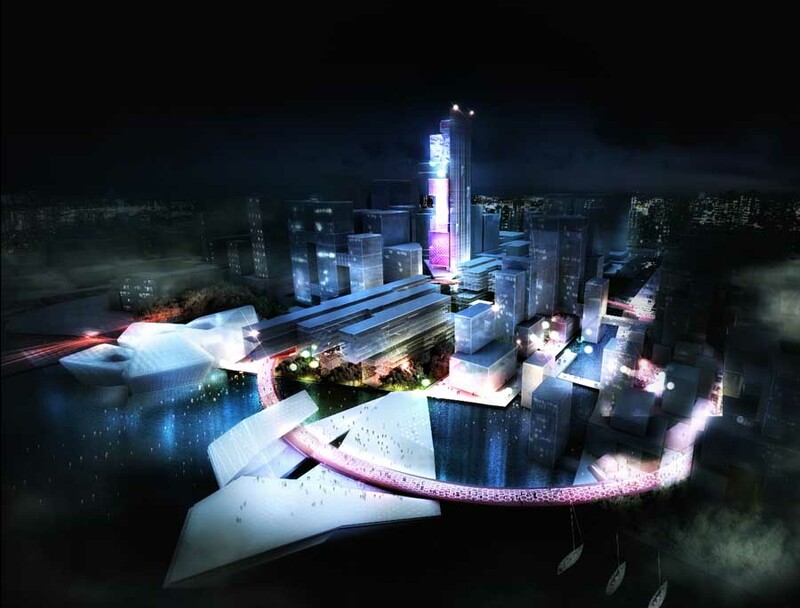 Context is the starting point of the Ningbo News and Media building design. As a reflection to the surroundings, the project appears a double-face character. Building on the south side has a clear form and a continuous street façade. As a result, the continuity of Jingjia road is kept. It also deals with the institutional buildings of government office area on the south. While on the north side, in order to protect the residential area and kindergarten, a large void is placed and developed into a square. The north-south axis is formed. The building volume reduces from south to north to protect the residential space. Besides that, the green park in the east brings elements from the new city ecocorridor. A landscape sequence is designed from river bank to the building, and then crosses through and connects with the square. 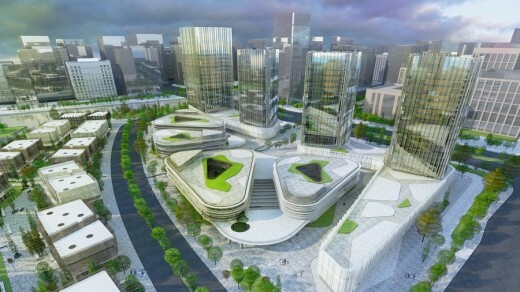 Several mountains with vegetation are placed in the square creating a new topography which actives the ground floor commercial functions of office building. A natural axis which consists of green landscape is formed. Building volume reduces from west to east and finally ends in the park. The second point is space and function. Building functions are arranged in two volumes by the urban axis. We design News and Media Building as a city with network system. The functions are arranged with 4 courts in the centre which creates a horizontal and vertical connection in the space with nature and man-made environment are connecting and each part related. The roof garden which related to the 4 courts not only serves as a visual art for the office upper levels but also contains a sport element jogging path which related to the sport facilities beside. The office for sell and lease has a clear and flexible layout which provides more possibilities for further divisions. Two solid volumes are arranged by the central landscape court. Three transparent cantilever cross the “solid” and connect north-south which provides a recreation space related to the square. Finally is the building form and façade. News and media building contains structural bone and light skin. The structure bone expresses a beauty of mechanical forces, while the transparent skin make the indoor and outdoor space connected. Office building continues the concept of news and media building. The difference is it has solid volumes made of concrete and stone and 3 large cantilevered transparent volumes. It creates a contrast between solid and void, heavy and light.